The doctors who were responsible for my co-managed care and for permanently damaging my vision are Tom Ballard, OD and Larry R. Taub, MD. Both of my LASIK treatments were performed at First Eye Care Dallas. These two doctors lied to me on numerous occasions, provided false and misleading information, withheld relevant information, maintained incomplete/insufficient medical records and documentation regarding my treatments and treatment plan, and engaged in false advertising. They continued to lie to me about my complications after the surgeries. My disclaimer - I'm not a lawyer or doctor so the below claims are only my interpretation of what Dr. Ballard and Dr. Taub are guilty of and should be tried in a court of law for. Their dishonesty and greed has cost me my vision and quality of life. These two doctors should be stripped of their optometry and medical licenses and sent to rot in a prison cell. I will continue to fight for them to be held accountable for their illegal, dishonest, and unethical actions. I did not get the LASIK procedure I paid for. Dr. Taub did not perform the Custom LASIK procedure that Dr. Ballard personally gave me a price quote on 2/9/2010. The price quote specifically listed the procedure as "Custom LASIK". There was no mention of conventional LASIK or any other procedure on this document. There was also no mention that the procedure could or would be changed without my consent. The conventional LASIK treatment Dr. Taub performed on 3/26/2010 was performed without my knowledge or consent. I would never have agreed to conventional LASIK. As the result of a surgery that I never consented to I now have permanently damaged vision. This is one of many risks with co-managed LASIK care. These two doctors have likely defrauded hundreds or thousands of patients with this scam. I spoke with a representative from DemandForce on 4/19/2013 who confirmed that First Eye Care requested that my review be removed so it was never posted to the First Eye Care website! 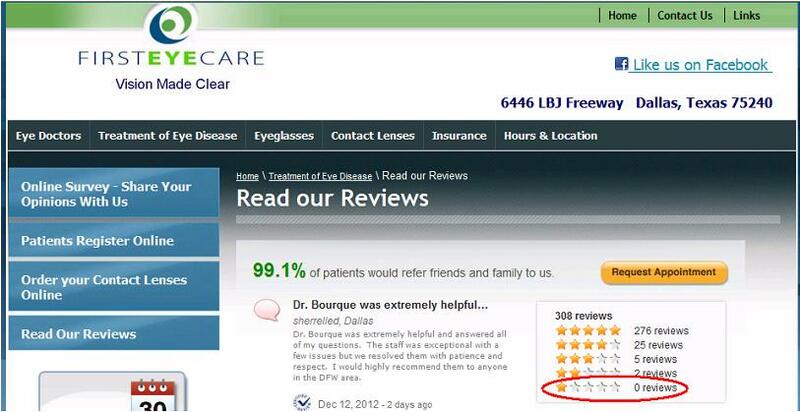 FIRST EYE CARE IS FALSELY ADVERTISING PATIENT SATISFACTION! 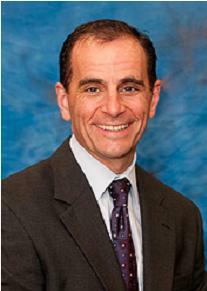 Dr. Taub falsely advertises that LASIK is a procedure for "Getting rid of glasses or contacts forever". This is a false claim! The truth is that most patients will require the use of glasses as they age. You are trading one pair of glasses for another and risking your vision in the process. LASIK does not prevent presbyopia, the inability to focus on close up objects as we age. Without having LASIK, near sighted patients could simply remove their glasses to see near objects. Studies also indicate that the majority of LASIK patients require glasses or contact lenses due to vision regression after LASIK. Screen capture taken from the Newman & Taub website on 12/14/2012 displaying false claims that LASIK will eliminate glasses or contact lenses forever. Both Dr. Ballard and Dr. Taub lied to me when I asked them if it would be safe to continue boxing after LASIK. Boxing was an important sport to me as it kept me healthy and happy. I was training and wanted to compete in the Dallas Golden Gloves. These greedy and dishonest doctors put an end to my participation in boxing. This was one of many hobbies that were no longer possible after having LASIK. Dr. Taub even explained how a boxing glove was a large, blunt object that could not damage my eye. This was a lie! The truth is that the paracentral region of the corneal flap only readheres to the corneal bed with approximately 2.4% the original strength of the cornea, leaving all LASIK patients at risk for accidental displacement of the corneal flap for the rest of their life. Does that sound like a safe safe procedure for a boxer? There is absolutely no excuse for doctors to lie to their patients and rob them of the lives they enjoy. 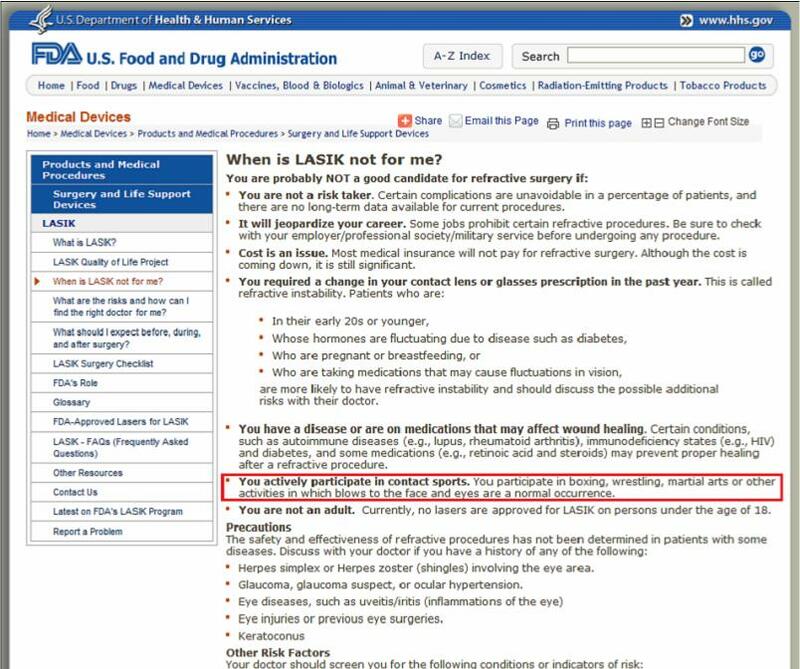 Screen capture taken from the FDA website. The FDA recognizes LASIK is not safe for individuals participating in boxing, why couldn't Dr. Ballard and Dr. Taub be honest with me? Dr. Ballard lied to the optometry board and stated the first time I would have seen a document with a VISX CustomVUE header was after I had requested my records, not before as I had stated. The truth is, I saw these documents the minute they were printed immediately after measurements were taken. Everything they have said has been a lie! Below is an image of their exam room. You can clearly see the printer next to the measurement equipment (Noted with a red arrow). First Eye Care performed all refractive surgeries within view of seating in their lobby. They had spectator seating along a set of windows to the operating room, and displayed the procedure on a large flat panel monitor. This unethical promoting of LASIK procedures reduced or eliminated the perceived risks by potential patients. All of First Eye Care's actions and oral communications presented LASIK as if it were as safe as a haircut, not as a serious surgery with serious risks and side effects. There is nothing ethical about how Dr. Ballard and Dr. Taub promoted or performed LASIK. This was also reckless as a child from the lobby could distract the surgeon by trying to open the operating room door or hitting the windows.